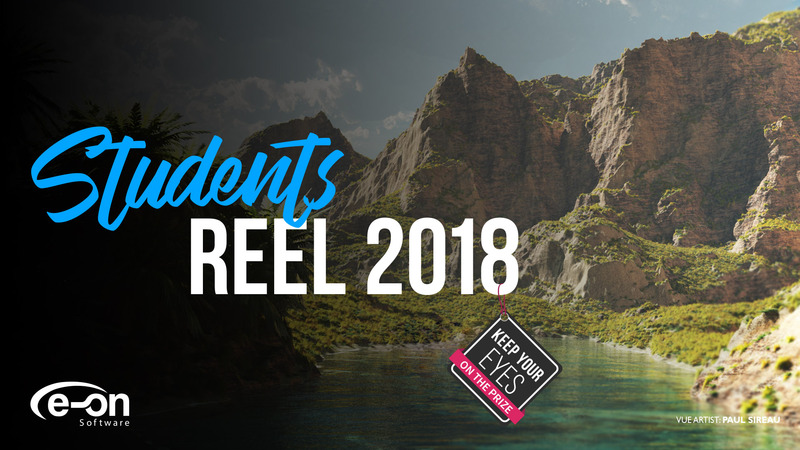 July 31, 2018 - Paris, France: Together with their sponsors, e-on software, leading developer of solutions for the creation, animation, rendering, and integration of natural 3D environments today announced the launch of the 2018 Student Reel Contest, for students to showcase their expertise in using 3D technology to create computer generated (CG) natural environments. This competition is open to students or those under the age of 26. Participants will be asked to submit an image of any kind of environment showcasing an explosion of vegetation, mountains, skies, etc. Submissions for the first round of the competition are now open and continue through October 5, 2018. On October 12, 2018, 20 finalists will be selected, and they will have until October 29, 2018 to send their animated scene files to be rendered by Ranch Computing. The winners of the competition will be judged by e-on and its sponsors and will be announced on November 5, 2018. Together with sponsors NVIDIA, Wacom, and Ranch Computing, e-on software will be awarding competition winners with more than $20,000 in 3D tools and resources. Entrants may use the application of their choice, in combination with any of the e-on software products. This includes any version of VUE (Esprit, Studio, Complete, Infinite or xStream), and PlantFactory – including the Free Trial versions. Judging is based solely on the quality, realism, and artistic merit of the entries, not on the software version used to create them. A representative from each of the sponsors (NVIDIA, Wacom, and Ranch Computing) will help the e-on software team choose not one, but five lucky winners from the 20 finalists chosen in round two of the competition. Learn more about our Prizes and sponsors, here. E-on software is the leading developer of solutions for the creation, animation, rendering and integration of natural 3D environments (VUE, PlantFactory, CloudFactory Ozone and Carbon Scatter). E-on software products are used worldwide by the film, television, architecture, game, science, educational and entertainment industries. E-on software products were used in feature films such as Dr. Strange, Kubo and the 2 Strings, Jupiter Ascending, Minions, Guardians of the Galaxy, The Croods, Dragons 1&2, Hunger Games, Hugo, Tintin, Super 8, Thor, Avatar, Clash of the Titans, Sucker Punch, Despicable Me 1&2, The Wolf Man, 2012, Lovely Bones, GI Joe – The Rise of the Cobra, Land of the Lost, Terminator 4, The Curious Case of Benjamin Button, Indiana Jones 4, Monster Vs Aliens, Australia, The Spiderwick Chronicles, KungFu Panda, Pirates of the Caribbean 2 and TV series such as Spartacus, Smallville, Battlestar Gallactica, Caprica, Stargate Atlantis, Stargate Continuum, The Vampire Diaries, and more. Read more on these stories in e-on software's Spotlights section: https://info.e-onsoftware.com/meetourusers. E-on software was founded on the premise that powerful graphics tools should never get in the way of the designer's creativity. By investing significant resources in research and development, e-on software is able to deliver cutting-edge, user friendly technologies that produce stunning digital nature scenery. In 2015, e-on software was acquired by Bentley Systems and now operates as an internal venture subsidiary. Download the entire press release, here. Bentley, the "B" Bentley logo, Be, VUE, PlantFactory, LumenRT, MicroStation, and ProjectWise are either registered or unregistered trademarks or service marks of Bentley Systems, Incorporated or one of its direct or indirect wholly owned subsidiaries. All other brands and product names are trademarks of their respective owners.